The City of Winnipeg has been regulated by the Canadian Food Inspection Agency (CFIA) for EAB. Any movement of all firewood of all species, ash nursery stock or ash wood (including wood chips, wood packaging or dunnage) out of this area is prohibited without written permission from the Canadian Food Inspection Agency. Questions may be directed to Contact Jason Watts at Jason.Watts@inspection.gc.ca or Fiona Ross at Fiona.Ross@gov.mb.ca; 204-793-2987. 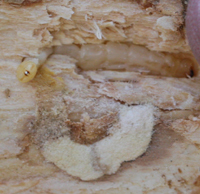 Alert: Emerald ash borer (EAB) has been confirmed in the City of Winnipeg. Surveys to determine the extent of the infestation are ongoing. 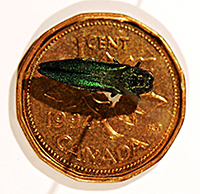 The emerald ash borer (EAB) is a highly invasive and destructive insect that has killed millions of ash trees in the U.S. and in the provinces of Ontario and Quebec. Since EAB is very hard to detect in the early stages, it often goes unnoticed until it's too late. For this reason, EAB has been difficult to control and manage. Prevention measures and early detection are the best defense against this devastating invasive forest insect.